This mini quilt was designed a few months ago right after I received this package of fat quarters by Bonnie and Camille that I won in a giveaway from Cynthia at Quilting is More Fun Than Housework. 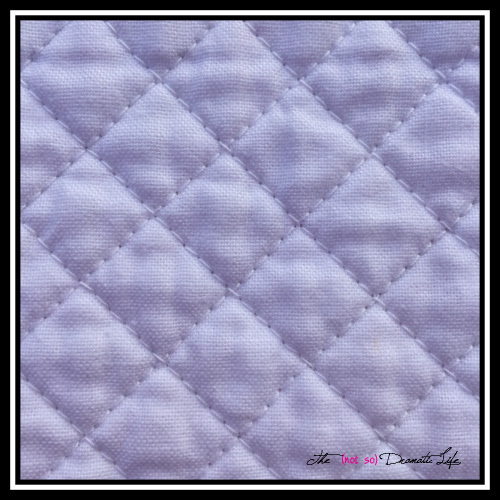 The fabrics come from Bonnie and Camille’s April Showers line of fabric, so I decided that April would be the perfect time to create and share this little quilt. 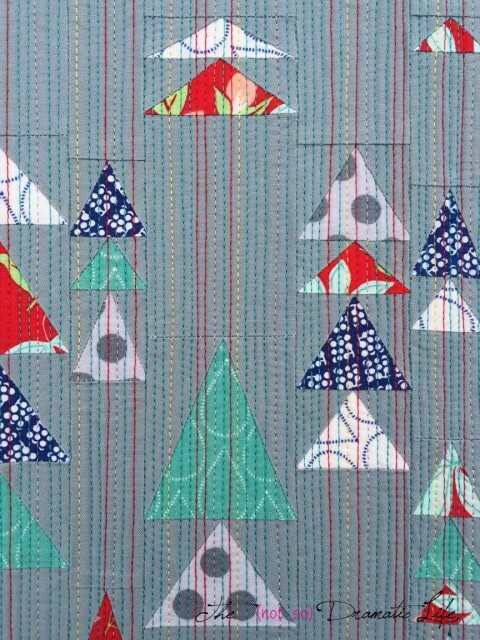 The abstract triangular raindrops in this quilt are foundation paper pieced in rows before being assembled into the quilt top. In deciding what fabric to pair with the April Showers Fabrics, I looked at several color options. I knew that I wanted to go with a solid background fabric in order to show off the cute prints in the fat quarter collection. White seemed a bit stark for this project, and the blues I had available were a little too cheerful. This mid-tone grey really captured the feel of a rainy day. I kept the backing simple by using the same grey fabric. This really allowed the matchstick quilting to shine. Most of the quilting was done with a teal colored 50wt cotton thread by WonderFil. I had read good things about this thread in the last issue of Generation Q Magazine, so when I saw their booth at the American Quilter’s Society show in Paducah last week, I knew I wanted to purchase a couple spools. It really worked out beautifully, and I used red and yellow thread that I already had on hand to add interest to the matchstick design. I wanted to add a little glitz to this quilt to emulate the shimmer of raindrops so I attempted to use silver metallic thread. In the past, I have not had the best experience with metallic thread, but this time it worked really well. The fantastic and helpful people in at the WonderFil vendor booth gave me a sample pack of thread which included a metallic silver thread with a rayon core. It is a really light, thin thread that went through my machine beautifully. There was no shredding or breaking of the thread, which was really exciting given my past experience with metallics. I was quite pleased with the life this small amount of shimmer the metallic thread adds to the design. Rather than keeping the entire binding grey, I decided to add small pieces of the April Showers fabric along one side of the bias. 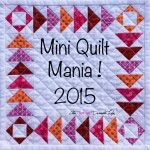 This week Darcy at Modern Cozy is starting a weekly link up for Mini Quilts called Mini Quilt Monday. 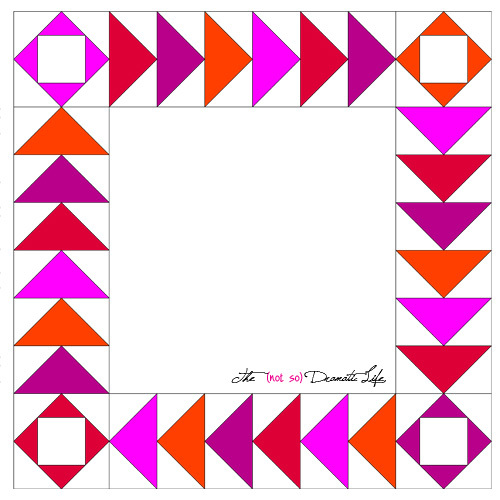 I am really looking forward to having a link up available that is dedicated to the fabulous mini quilt! 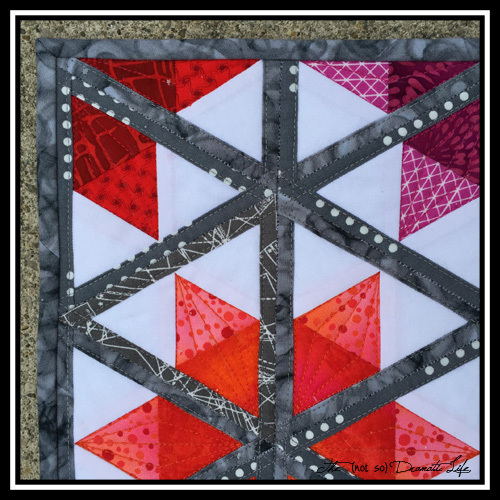 I am also linking up with Finish It Up Friday at Crazy Mom Quilts, Whoop Whoop Friday at Confessions of a Fabric Addict, Sew Cute Tuesday at Blossom Heart Quilts, and the Paper Piecing Party at Quilt Art Design. Please stop by to see the fantastic sewing being done! 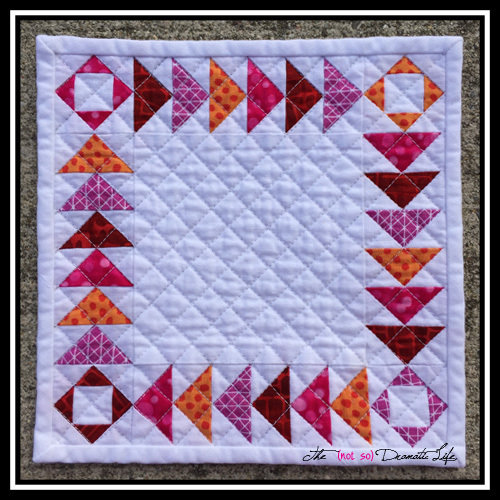 For this week of Mini Quilt Mania I wanted to reinterpret a classic block. Courthouse Steps is a block that I have always found attractive, and I was wondering what would happen with the block if I forced it into a wedge shape rather than the traditional square. 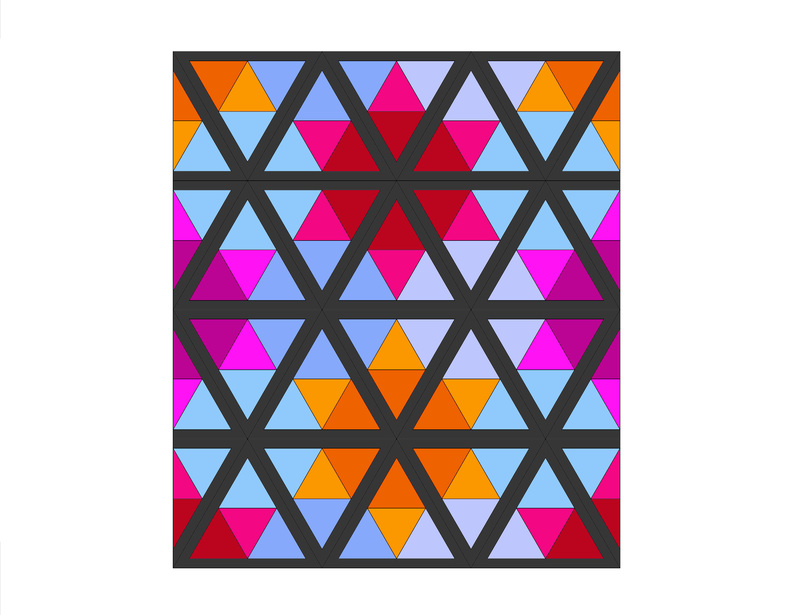 This week’s quilt is the result of this experiment. I have been doing a lot of hexagonal work lately, so I thought that I would give an octagonal format a try. Each wedge has a forced perspective courthouse steps block and a triangle to finish the shape. There were several options for adding color to this pattern. 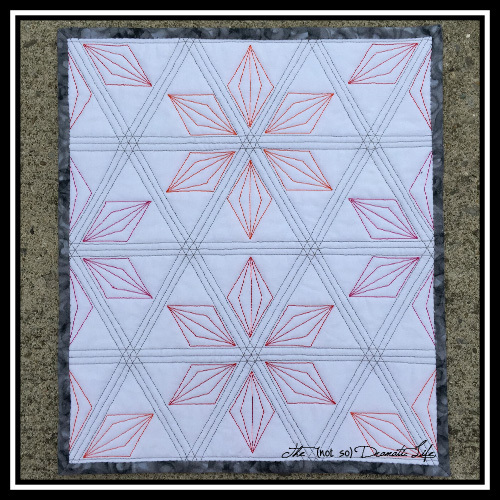 I considered keeping the design very simple, using only two fabrics and enhancing the starburst effect that happened when only two sides of each block had a contrasting fabric. 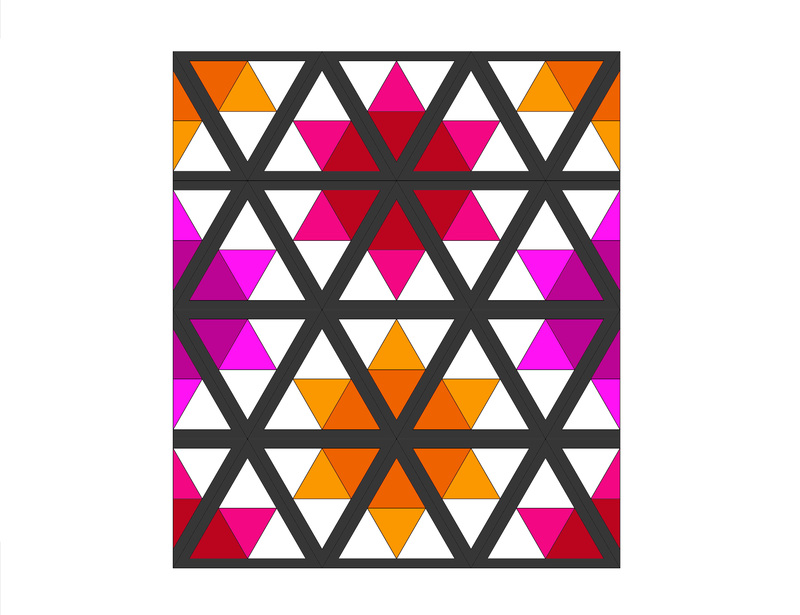 Another option I considered involved using a gradient along three sides of each block. 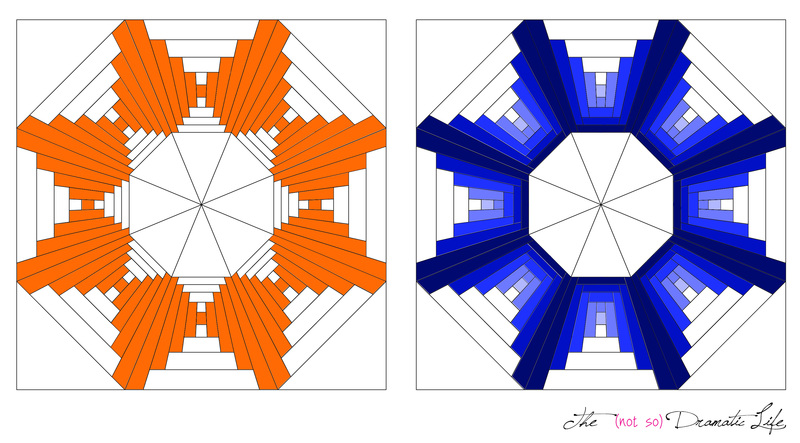 This still maintained a starburst effect, but it also enhanced the octagon base. 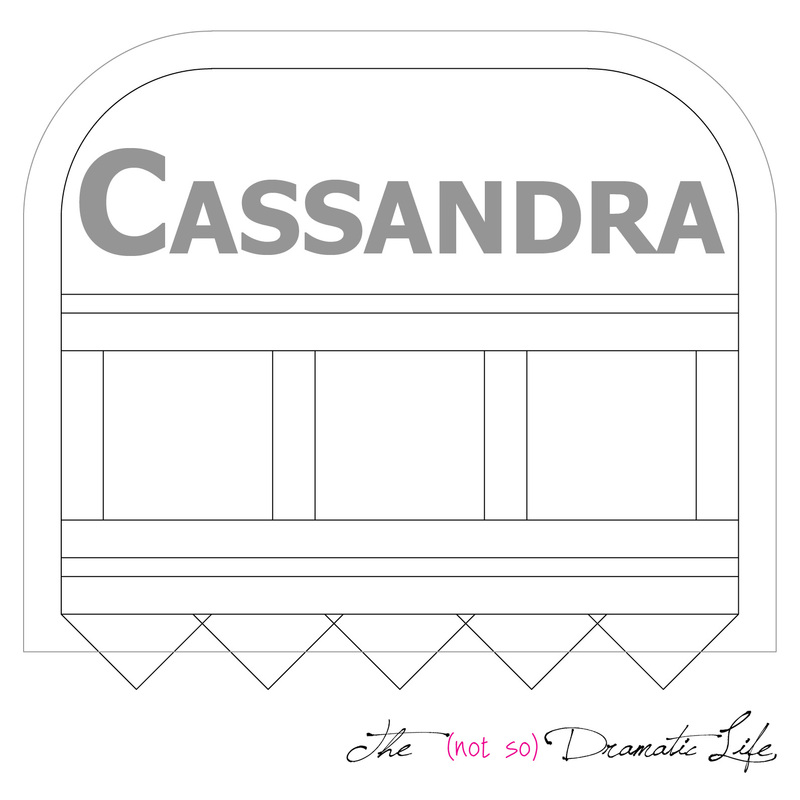 I thought this version had a real Art Deco feel. 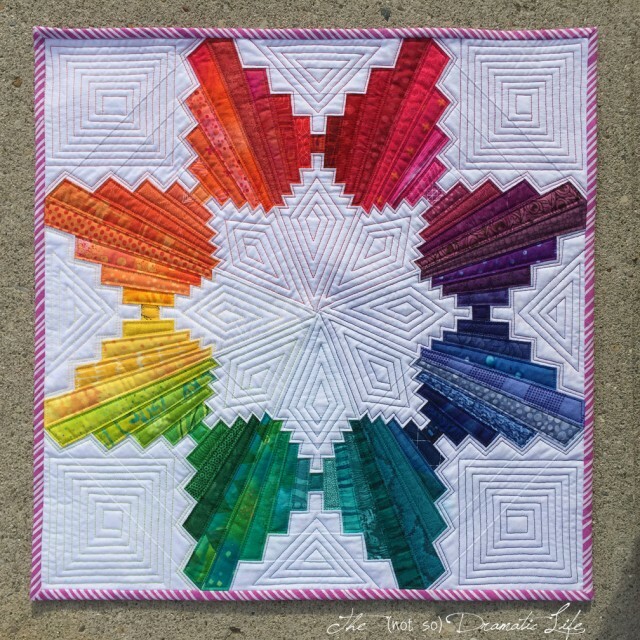 For this quilt I ended up going with the starburst layout, but instead of one color I decided to try a rainbow effect. 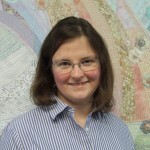 I have always admired everyone’s rainbow quilts, but I had never attempted one myself. There are 74 fabrics in this quilt: 72 forming the color wheel, white Kona cotton for the background, and a Lotta Jansdotter stripe for the binding. 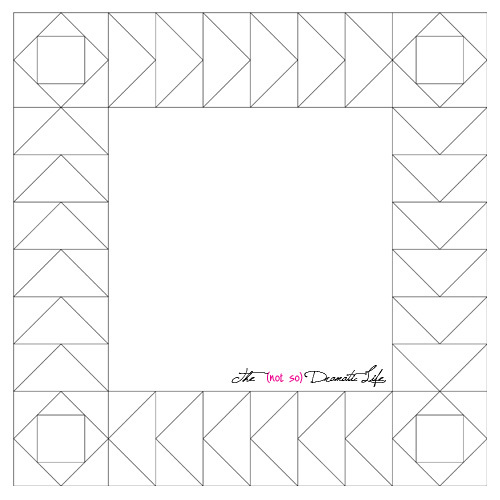 To guarantee the wedges maintain the desired shape and size, I developed foundation paper piecing templates to create the quilt top. The back of this quilt is also white Kona so that the quilting is really shown off. For the quilting, I used nine different threads to quilt this piece. 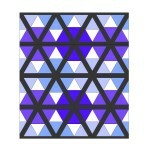 Each wedge has echo and diamond quilting in the white areas and echo quilting in each segment of color. Thread: Pieced using white Gutermann Mara 100. 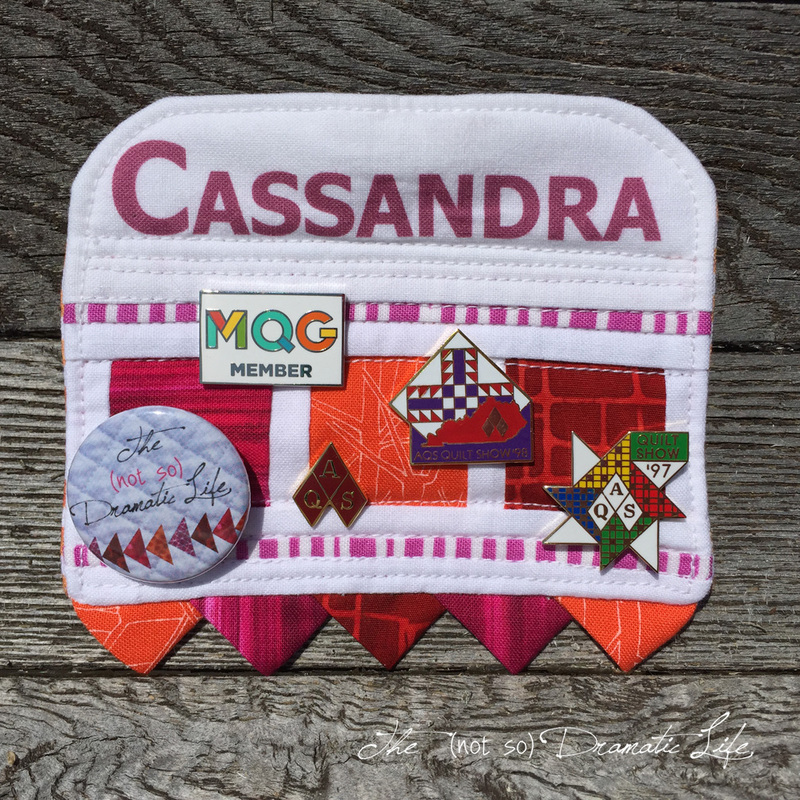 Quilted with Connecting Threads cotton Essentials quilting thread in Red, Grape Juice, Peridot, Persian Blue, Persimmon, and Sangria as well as yellow, teal, and green in Gutermann Mara 100. 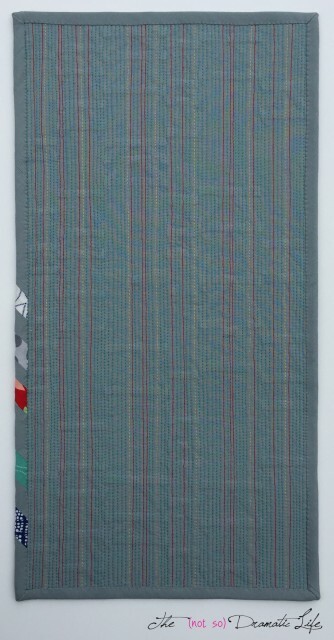 Binding: Striped fabric, cut on the bias in 2″ wide strips, machined stitched to the front of the quilt, hand stitched to the back. Rainbow color scheme- I’m pretty sure I have never used so many different fabrics in a mini quilt! 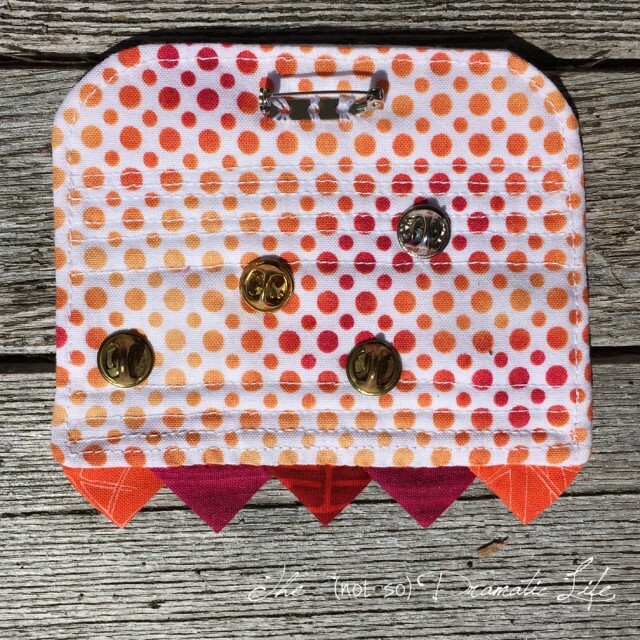 I’m linking this week’s quilt up with Fabric Tuesday at Quilt Story, Scraptastic Tuesday at She Can Quilt, Oh Scrap! at Quilting is More Fun than Housework, Whoop Whoop Friday at Confessions of a Fabric Addict, Finish It Up Friday at Crazy Mom Quilts, Paper Piecing Party at Quilt Art Designs, Needle and Thread Thursday at My Quilt Infatuation, Let’s Bee Social at Sew Fresh Quilts, and Sew Cute Tuesday at Blossom Heart Quilts. Please check out the amazing work being produced! 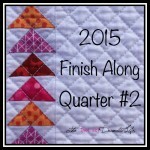 I am excited to kick off Mini Quilt Mania with finish #1! 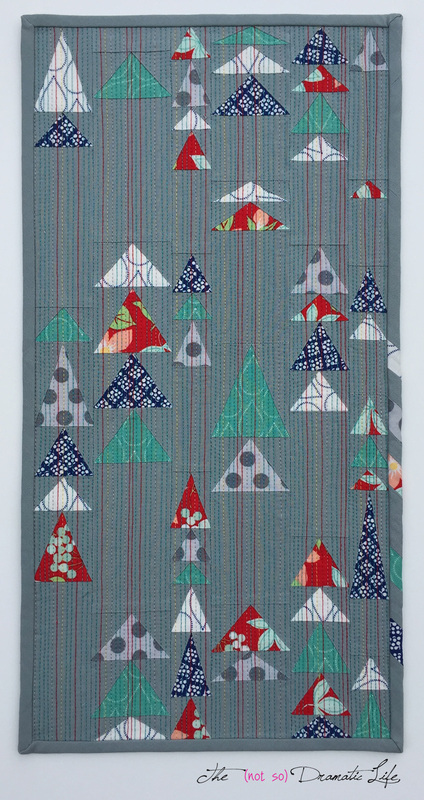 For this quilt I wanted to use the New Year as an inspiration. For a lot of people, New Year’s is a time for big parties and fireworks. For me, the New Year is celebrated by watching the Times Square Ball Drop on television. 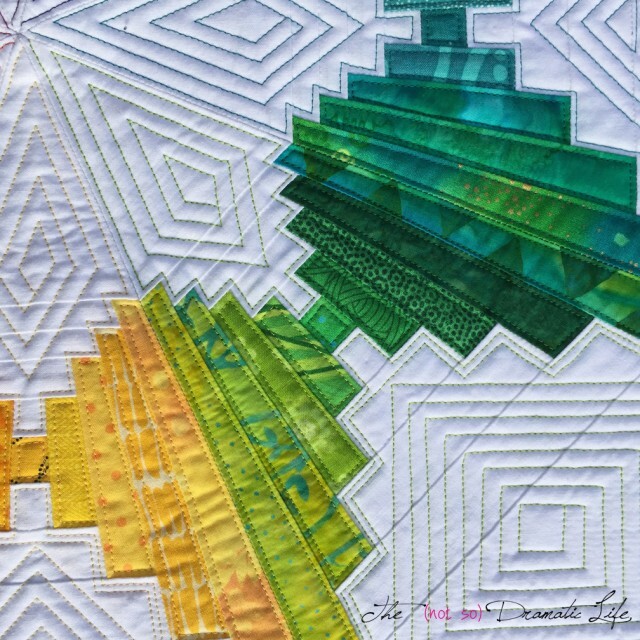 So I decided I would focus on that iconic piece of lighted metal and glass for my inspiration for this quilt. While I usually like to observe my objects of inspiration in person, I am in the midwest, and the Times Square Ball is not. Turning to the internet, I looked at several sources including the fact sheet found on the Times Square Alliance page about the New Year’s Eve Ball. 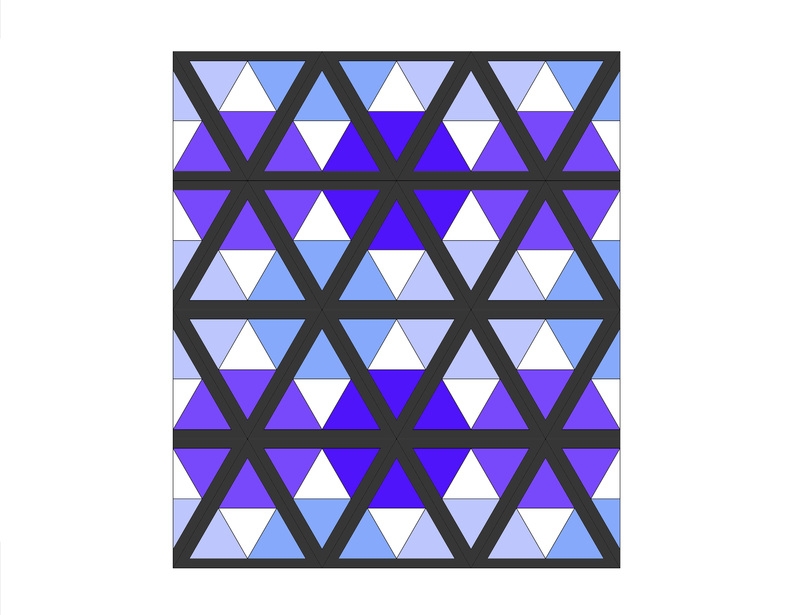 Not really a true sphere, the ball is made up of triangles within triangles. 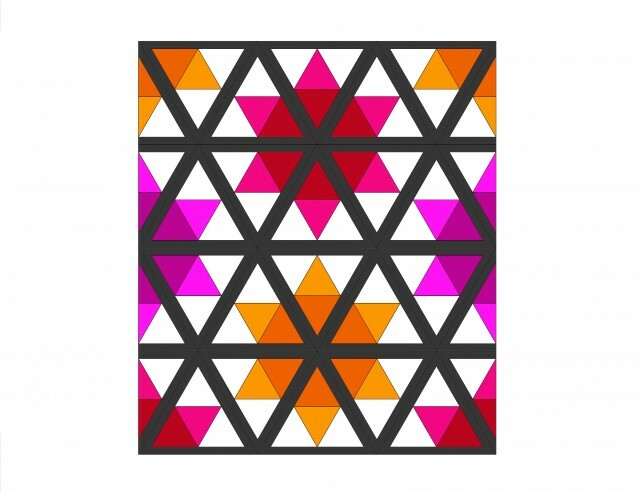 These triangles are lit using LEDs (really exciting to the theatre designer part of me!) which allows for almost endless color combinations and patterns. 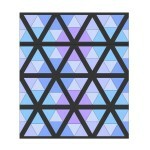 I started out by creating a line drawing of triangles within triangles. Then I added borders around each main triangle to represent the metal structure of the ball. 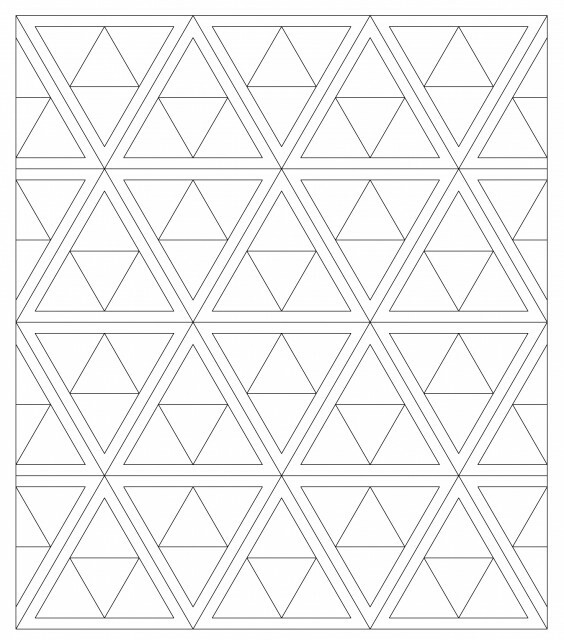 I knew that I wanted to use medium to dark greys in the borders of the triangles to give the design a slightly industrial feel. (I like to juxtapose “utilitarian” with “pretty!”) Then I started to experiment with color. 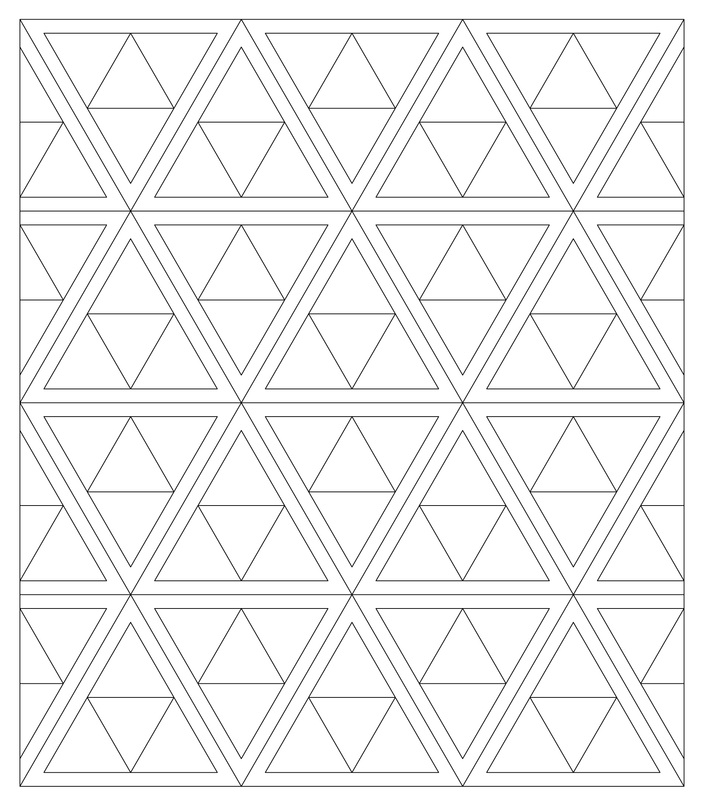 At first I was thinking along the lines of emphasizing the hexagons formed in the design, but I soon moved onto star configurations. The gallery below is a small sample of the designs I considered. I am pretty sure the most challenging part of this process was decided which color scheme to go with! Ultimately, I ended up choosing the Red, Orange, and Violet Stars. I pulled from stash fabrics for this project, and decided to select one dark and one light material of each of the three star colors. 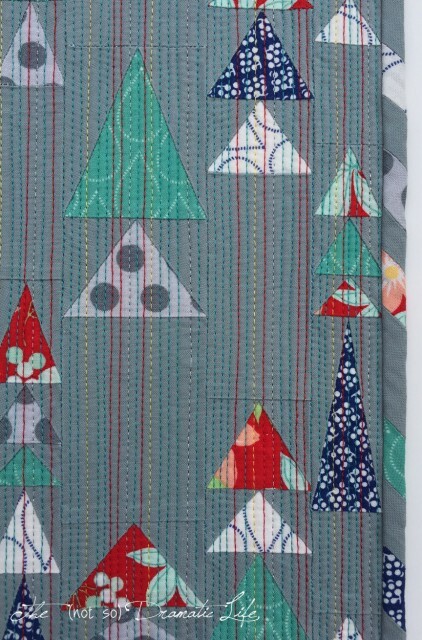 I also pulled three different grey fabrics for the triangle borders. 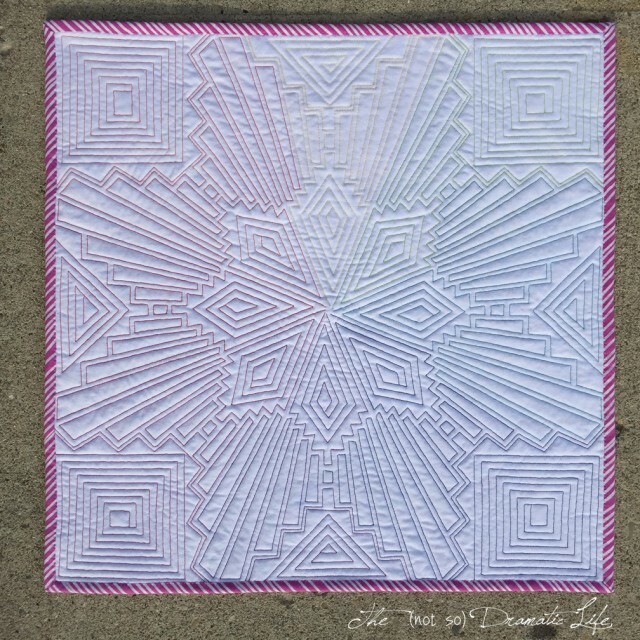 The top is constructed using paper foundation piecing techniques. 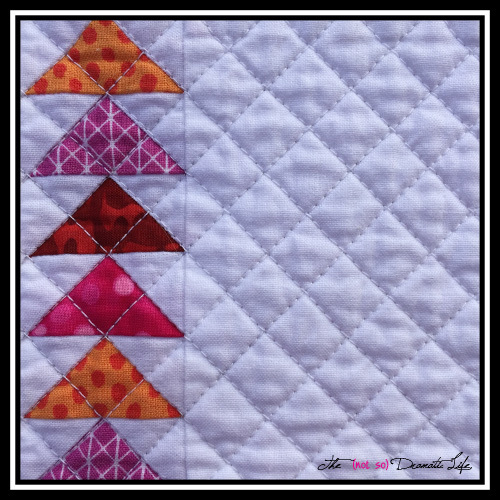 For the quilting design, I wanted to emphasize the straight lines found in the quilt top, and I ended up choosing to outline and enhance each element of the design using a coordinating thread. Since I was quilting in several colors, I used a white backing fabric to really show off the colors of the threads. 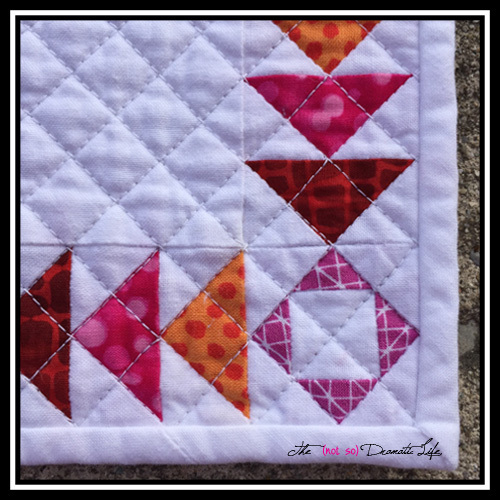 Overall, I am really happy with this quilt, and I may consider creating a larger scale quilt using this block design. Title: Happy New Year 2015! Binding: Grey bias- cut in 2″ strips, machine stitched to the front of the quilt, and hand stitched to the back. I am linking this post up with Show Off Saturday at Sew Can She, Let’s Bee Social at Sew Fresh Quilts, Needle and Thread Thursday at My Quilt Infatuation, Paper Piecing Party at Quilt Art Designs, Whoop Whoop Friday at Confessions of a Fabric Addict, Finish It Up Friday at Crazy Mom Quilts, and Sew Cute Tuesday at Blossom Heart Quilts. Please take a moment to stop in and see all of the wonderful projects being created! As I began preparing posts for the upcoming year, I realized that there would be occasions I would need a general graphic or background image. I considered creating a graphic from scratch in a photo editing program, but the more I thought about it, the more I wanted to create a quilt to use as a background image. 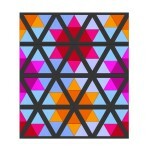 This is the quilt I designed. As I began sketching, the only major requirement I had of this design was a large area of negative space. I knew that I would want to be able to easily place text over the image. 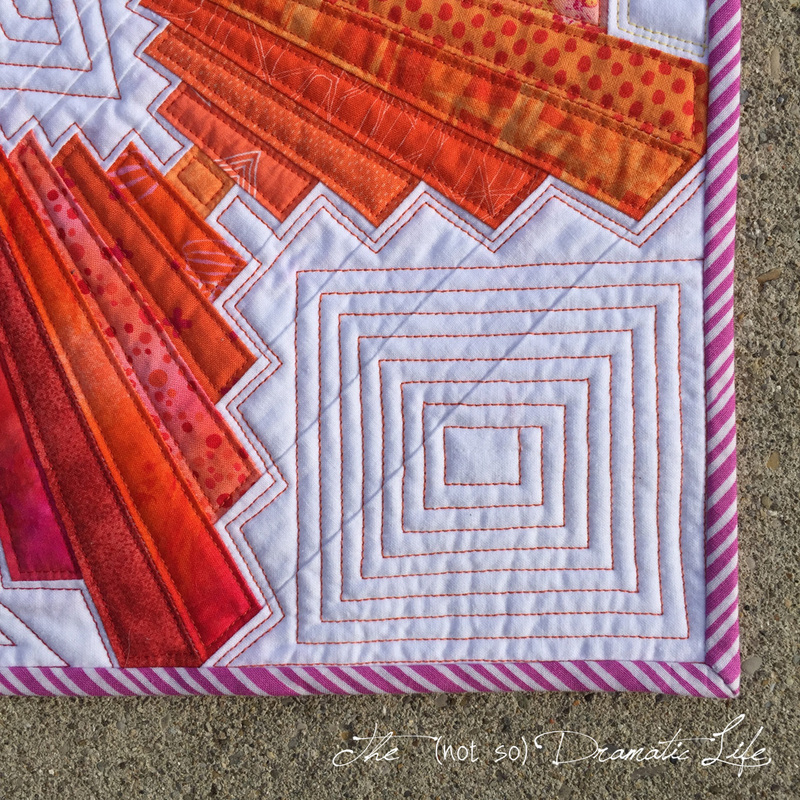 Ultimately I landed on a classic “Flying Geese” border design with separate corner blocks. 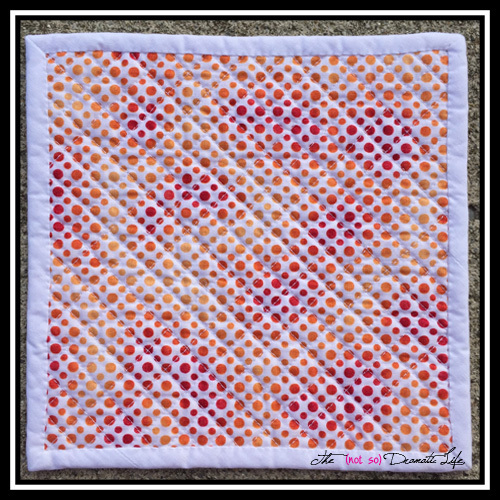 I paper pieced each corner block and border for the quilt top and then chose a bright red and orange dot for the back of this little quilt. 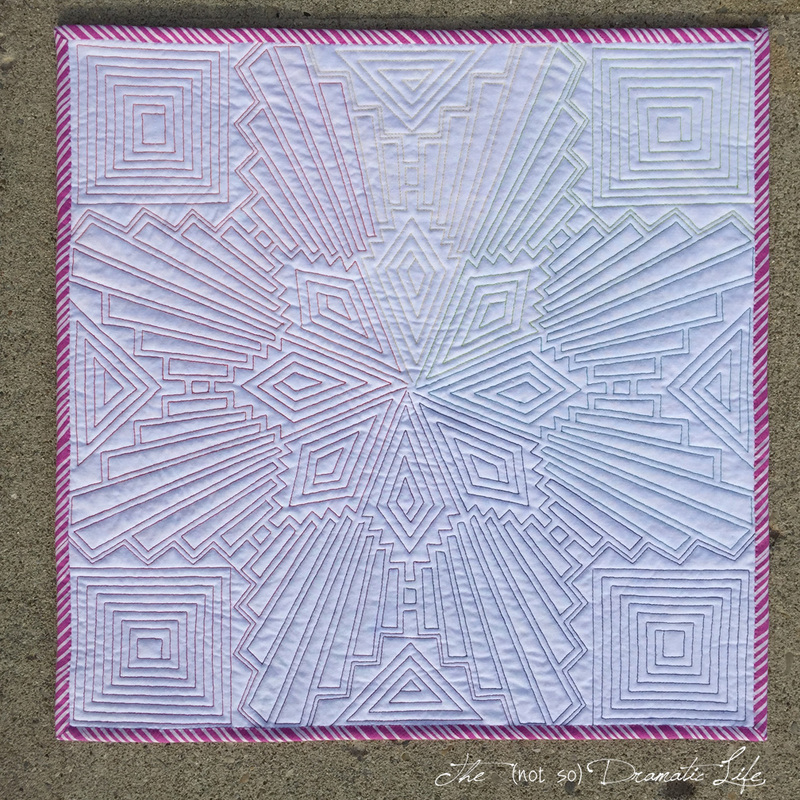 I quilted the piece using diagonal lines approximately 1/2″ apart. 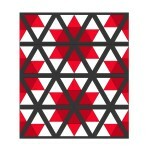 I am happy with the finished quilt, and I think I will be able to use it in a lot of different configurations. I am very happy with the cheerful color scheme, and I’m certain that this image will be making an appearance frequently in the coming year. 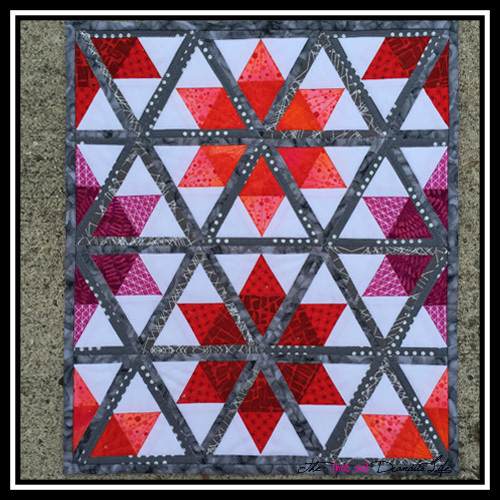 I am linking this post up with Let’s Bee Social at Sew Fresh Quilts, Finish It Up Friday at Crazy Mom Quilts, and Whoop Whoop Friday at Confessions of a Fabric Addict. I hope you all have a wonderful New Year!